The popular TV series “Cheers,” which ran for eleven years (1982-1993), took place in a congenial bar “where everybody knows your name.” It bore about the same relationship to real-life bars and their regulars that “CSI” does to real-life forensics labs. It must have been some time between 1988 and 1993 (the period during which I was driving my car to work at various alcoholism treatment facilities with the radio on) when the show was being discussed on some talk radio show—maybe one of the actors was a guest—and a guy called in to say that he’d looked for that conviviality in many a bar and never found it, but he’d found it in church basements. 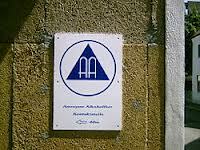 Anyone who knows anything about Alcoholics Anonymous would know he was talking about AA. I’ve had stories in two anthologies by members of the New York chapter of Sisters in Crime. Both featured my recovering alcoholic series protagonist, Bruce Kohler. The anthologies were titled Murder New York Style, and the second had a subtitle, Fresh Slices. (Out of sheer curiosity, may I ask if anyone does not get the reference?) The call for submissions specified that the stories must be set in parts of New York City that don’t figure in the tourist guidebooks. 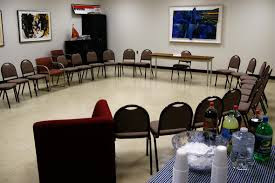 I knew exactly what to write about: the church basements that house hundreds of AA meetings weekly. In “Death Will Tank Your Fish” (a Derringer Award nominee), Bruce attends two different meetings, one housed in an Upper East Side High Episcopal church that attracts the carriage trade, the other a Kips Bay area basement that has meeting round the clock, where Bruce runs into a brain-fried childhood friend who’s just gotten out of Bellevue. He attends many other meetings in the course of three novels, a novella, and three additional short stories, each with its own flavor: a Greenwich Village meeting with a GLBT (gay, lesbian, bisexual, and transgender) focus, a lunchtime meeting in the Wall Street area where all the men show up in suits and ties, a meeting that’s convenient for barely sober homeless folks who come for the free coffee and cookies—and some of whom stay for the fellowship and and a second chance. Bruce, the quintessential New Yorker with a smart mouth and a not-too-well-concealed heart of gold, never expected to find himself threading the maze of meeting rooms where recovering alcoholics congregate to tell their stories (often to howls of understanding laughter), support each other’s sobriety, and talk about the remarkable changes in their lives. His sidekick Barbara,a nice Jewish girl and a world-class codependent, still can’t get over it that she sets foot in any church, not only to attend Al-Anon but to sneak into the occasional AA meeting with Bruce and Jimmy (her boyfriend, Bruce’s best friend), where she’s convinced they have a lot more fun. In the old days, AA meetings were the second smokiest places in New York (after bars). Nowadays, the smoking takes place in the street outside. If you see a crowd wreathed in smoke outside the side entrance of a church, chances are a meeting has just let out or is taking a break. You never know (and you’d better not tell!) whom you’ll see inside: down-and-outers, writers, actors, musicians, stay-at-home moms, construction workers, Park Avenue matrons, lawyers, nurses, investment bankers, and a few celebrities just out of rehab, desperate for ongoing support, and trusting that the tradition of anonymity will be respected. Maybe you’ll see a mailman or a cop who dropped in to rest his feet and stayed because he heard another alcoholic tell his own story. I had just snagged myself a ginger ale when Barbara joined us. Champagne fizzed merrily in the glass she clinked with mine. Great post. I have in-laws who are friends of Bill W, along with several friends of mine. So I always welcome your columns about this subject. Fresh slices says pizza to me. Hmm? Funny, I was just working on an article about Wall Street and thinking about a particular church basement in NYC, specifically Trinity Church in lower Manhattan. During lunchtime, they used to show Betty Boop movies in the basement and yes, I was addicted. Dix, the Tenderloin was on the West Side, and it hasn't been called that in about a hundred years; Kips Bay is on the East Side, more or less the same stretch (20s to 40s). Leigh, there are plenty of 12-step meetings at Trinity Church. And yes, the "fresh slices" in the SinC anthology subtitle is a reference to pizza--figuratively, tasty new stories with a New York flavor. Elizabeth, it's a fascinating milieu. I think I remember a Larry Block story, where Scudder sponsors a guy in AA, who turns out to be a stalker, and uses Scudder to finger his victims. I don't remember whether Scudder himself is the actual target, and the people who get in the way proxies. It was, however, a deeply creepy story, not least because it was about trying to pull yourself up by your bootstraps, and finding the place where you'd sought help no safety.